After five years of development and about 40,000 tests worldwide, the mobile eye-test device developed by MIT spinout EyeNetra is coming to hospitals, optometric clinics, optical stores, and even homes nationwide. But on the heels of its commercial release, EyeNetra says it's been courting offers from virtual-reality companies seeking to use the technology to develop "vision-corrected" virtual-reality displays. "As much as we want to solve the prescription glasses market, we could also [help] bring virtual reality to the masses," says EyeNetra co-founder Ramesh Raskar, an associate professor of media arts and sciences at the MIT Media Lab who co-invented the device. The device, called Netra, is a plastic, binocular-like headset. Users attach a smartphone, with the startup's app, to the front and peer through the headset at the phone's display. Patterns, such as separate red and green lines or circles, appear on the screen. The user turns a dial to align the patterns and pushes a button to lock them in place. After eight interactions, the app calculates the difference between what the user sees as "aligned" and the actual alignment of the patterns. This signals any refractive errors, such as nearsightedness, farsightedness, and astigmatism. The app then displays the refractive powers, axis of astigmatism, and pupillary distance required for eyeglasses prescriptions. In July, the startup launched Blink, an on-demand refractive test service in New York, where employees bring the Netra device to people's homes. In India, EyeNetra has launched Nayantara, a similar program to provide low-cost eye tests to the poor and uninsured. Both efforts used EyeNetra's suite of tools, now available for eye-care providers worldwide. According to the World Health Organization, uncorrected refractive errors are the world's second-highest cause of blindness. EyeNetra originally invented the device for the developing world—specifically, for poor and remote regions of Africa and Asia, where many people can't find health care easily. India alone has around 300 million people in need of eyeglasses. But the United States has offered the best market, in terms of adoption, Raskar says. "The consumerization of health is happening much faster here in the U.S. than in the developing world," he says. "If you're to play that role of smartphone-based personalized health solutions, then we have an amazing lead over anyone else." Over the past six months, EyeNetra has been courting license agreements and full acquisitions from virtual-reality companies, Raskar says. The idea, he says, is to use the startup's technology to develop custom screens to fit a user's eyeglass prescription. Prescription screens could make virtual-reality devices more form-fitting for a more immersive and comfortable experience, Raskar says: Right now, devices are built with extra space on the viewing end for people wearing glasses. But it could also help solve a larger issue: aligning the eye lens, prescription lens, and the virtual-reality screen. "All three have to be aligned in the right way for you to enjoy the experience," Raskar says. If the glasses shift, for instance, optical aberrations disrupt the viewing, potentially causing headache, fatigue, and nausea. EyeNetra's technology measures how a user's optical refractive errors will affect how they see patterns on a digital display—in an environment very similar to a virtual-reality headset, Raskar says. Therefore, companies could use these precise measurements to develop screens that are pre-corrected to a user's specific refraction errors. "It's personalized correction," Raskar says. "Your [vision] correction is built into the headset." Such an approach could be game-changing, Raskar says, as billions of dollars have recently been invested into virtual-reality technology: In 2014, Facebook acquired Oculus Rift for $2 billion; Google and other big companies recently backed Magic Leap with more than $540 million; and Microsoft has starting pooling resources into virtual-reality research. "In addition to the major business [EyeNetra] is doing for prescriptions, it can also disrupt virtual reality, which is an even bigger market," Raskar says. Around 2009, Raskar and some of his Media Lab students developed a prototype of Netra: A small, plastic device was clipped to a smartphone, and viewers used the phone's keyboard to align the patterns. The device was designed as an inverse of a traditional Shack-Hartmann wavefront sensor machine, which shines a laser into the patient's eye and measures the refracted light with a photon sensor to find optical aberrations that affect eyesight. Essentially, Netra replaces the expensive sensor with a smartphone display. Because the red and green light goes through different parts of the eye, aligning the two colors similarly demonstrates any optical aberrations. 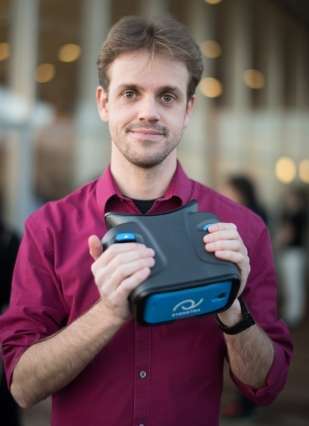 Later that year, Raskar and EyeNetra co-founder and chief technology officer Vitor Pamplona, who co-invented the technology, brought the invention to MAS.533 (Imaging and Fabrication Ventures), a class he co-teaches that presents image-based projects for students to further innovate. There, teams of students ran the device through several case studies, researched markets, and established a network of investors. Over the next few months, Raskar, Pamplona, and other students entered the prototype in MIT's IDEAS competition, where they won a prize, and the MIT $100K Business Plan Competition, where they earned a spot as semifinalists. Then, a grant from the MIT Deshpande Center for Technological Innovation officially launched the company in 2010. "But we realized we had to start all over again," Raskar says. This meant a complete redesign of the product and business plan to focus less on the technology and more on market need. "As much as we wanted to be disruptive in long run, the reality of the world was that we had to work with really good partners," he says. EyeNetra teamed up with the LV Prasad Eye Institute and Lotus Eye Institute and Hospital, among other clinical partners, to help conduct tens of thousands of tests worldwide. About 340 product iterations led to an improved device and better user interface. For instance, around three years ago, the team realized that people didn't perform well interacting with the phone. So, for the current design, they moved all buttons and knobs to the actual device. That change, and other small tweaks, made the device easier and more widely used, Raskar says. "We were naive in thinking that if you solve the optics problem, it will be good. But in reality there are three parameters: the machine and its optical design, the eye and its involuntary activities, and the human perception," he says. "Getting all those right in the same design is nontrivial." Moving forward, Raskar says EyeNetra aims to capitalize on the "consumerization of health" phenomenon in the United States, where consumers are gaining access to innovative medical tools for personal use. "The biggest impact we could have is playing a key role in bringing health solution technologies to people at the their homes or schools," he says.